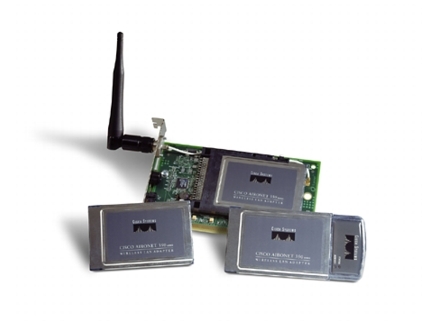 Cisco Aironet 802.11a/b/g Wireless PCI Adapter provides high-performance 54-Mbps connectivity in the 2.4- and 5-GHz bands. Whether configured to support single 802.11b coverage, single 802.11g coverage, single 802.11a coverage, dual-mode 802.11a/g coverage, or trimode 802.11a/b/g coverage, the Cisco Aironet 802.11a/b/g Wireless PCI Adapter is Wi-Fi® compliant and combines the freedom of wireless connectivity with 802.11i/ Wi-Fi Protected Access 2 (WPA2) encryption for the performance, security, and manageability that businesses require. The low-profile form factor and two-meter cable length provide significant flexibility for installation in low-profile devices, such as slim desktops and point-of-sale (POS) devices. For versatility, both a low profile and a standard profile bracket frame are included with the adapter. The attached dual-band, 2.4/5-GHz, 1-dBi effective gain antenna has a two-meter cable that enables optimal placement for maximum performance.